…enter to win one or more of these FABULOUS PRIZES! 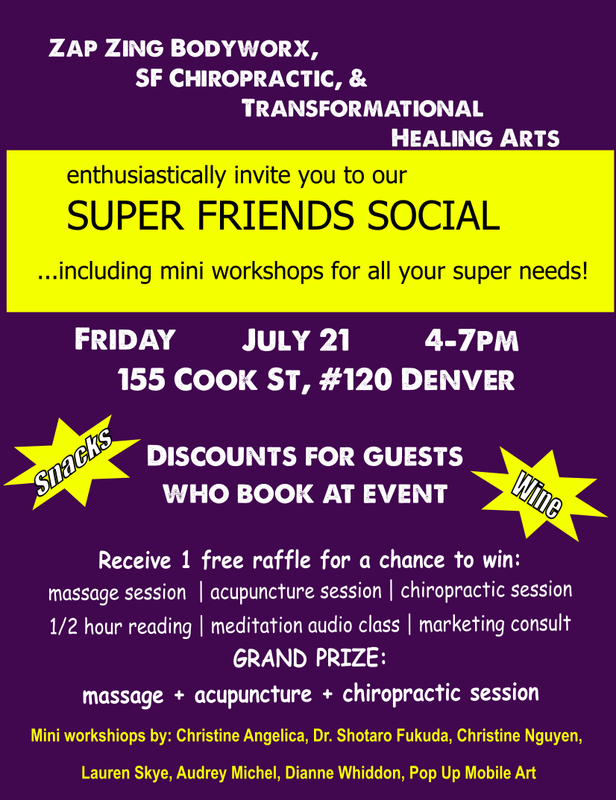 · GRAND PRIZE RAFFLE: one Acupuncture + one Bodywork + one Chiropractic session! Lauren Skye, Founder of Inner Connection Institute. Learn five powerful steps to quiet the mind, relax and recharge: Ground, Center, Notice, Release and Replace. Access the realm of energy to change your reality and get a new result. Use the steps to make a bad day good and a good day great! Diane Whiddon, spiritual business coach and branding expert. Learn why the 'doing' of your business doesn't matter as much as how you're 'being’. Audrey Michel, author of Rewired Life and spiritual growth coach. Open your eyes to how you can break patterns by busting through emotional short circuits; learn new tools for releasing limiting beliefs and increasing connection to inner wisdom. Untangle emotional stress and negative patterns. Rewiring your life is about creating a new nervous system, one choice at a time. Moment by moment. With a new nervous system you are able to look at the world with a new set of glasses. Christine Nguyen, L.Ac., Transformational Healing Arts. Live demonstration of acupuncture including time for audience questions. Dr. Shotaro Fukuda, SF Chiropractic. Learn what makes 'good posture' and techniques to maintain it. Christine Angelica, LMT, Zap Zing Bodyworx. Mobility techniques to do at the office or at home specific to relieving lower back and increasing mobility. Aim Brubaker, Pop on Over Art Mobile Studio. Displays of art projects and information on paint and wine parties at your home or community space. As a thank you for supporting us over the years, we are hosting a super friends social for you, your family, and friends.